Posted by Megan Lewton on February 4, 2019 in Lifestyles, Media minutes. I am very, very picky about TV shows. If I had a dollar for every time I started a show and didn’t finish it, I would be rich enough to buy an in-house theater to watch the same episodes of “Parks and Recreation” on a constant loop. I know what kind of shows I like—typically sitcoms—and I don’t usually stray away from that. Based on the novel of the same name by Caroline Kepnes, “You” is about a bookstore manager, Joe (“Gossip Girl’s” Penn Badgley), who meets Beck (Elizabeth Lail), a grad student and aspiring writer who comes into Joe’s store, and instantly becomes obsessed with her. He stops at nothing—whether it be stalking, manipulation or even violence—to have and to hold Beck. “You” has a solid balance between action, intense dialogue and Joe’s creepy, suspenseful voiceover that fills the air a significant amount of the time. It also has plot twists that made me audibly gasp, as well as scenes that were so painful to watch that I had to cover my eyes. What’s interesting about “You” is that Joe, who should be the apparent antagonist, is often perceived as the protagonist. After all, it is told from his perspective, so we see why he is doing these things, even if it’s still not justied. In addition, Joe is shown doing kind, selfless deeds for the people around him, which humanizes him and makes the viewer temporarily forget that he’s a homicidal sociopath. There were plenty of times that I caught myself rooting for him before snapping back into reality and recognizing that Joe is a master manipulator and an absolute maniac. With a winding storyline that leads up to the very end of season one, “You” is one of the best TV dramas I’ve ever seen. I watched it when I had any amount of downtime— while getting ready, in between classes, when I was alone in the car while my friend ran into a store for five minutes. If you’re going to take my advice and watch it (seriously, you won’t regret it), I’d advise waiting until you have a few hours of free time blocked off, such as on the weekend or when you’re done with homework for the night. It’s not the kind of show you can watch and take a break. 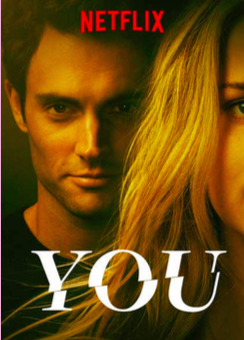 Although season one was based on the novel, “You” has been renewed for season two, with scenes that will take place outside of the original book. Although there has not been a release date announced, it’s set to return later this year. If you’re looking for a suspenseful thriller that you can binge in just a couple of days, pick “You.” And learn from Beck’s mistakes: close your curtains.